Click for larger image in separate window. I’ve changed the name of this current series slightly to focus in on the Birth Pangs noted in Scripture that lead us up to the end of this age. It makes more sense because things become very specific. In our previous post in this series – Bible Warns of Apostasy and Persecution, Part 6 – we zeroed in on earthquakes, famines, and the nation against nation idiom used by Jesus in His Olivet Discourse of Matthew 24 (see also Mark 13 and Luke 21). We also talked about the fact that as we moved toward the end of this age, we would see more false Christs of whom, Jesus said would deceive many. This is happening today as evidenced by the fact that several men currently alive now claim to be Jesus and have large followings. Apollo C. Quiboloy comes immediately to mind as one who has thousands of followers in the Philippines. Why does this occur? It’s because people today in general lack discernment. They lack it because they’ve been trained through movies, TV, video games, and music to go by how they feel about something. It has been a very surreptitious way of training people to use what is known as emotional virtue (aka political correctness or Cultural Marxism) to determine truth. People my age will remember the song If Loving You is Wrong…(I Don’t Want to Be Right) from the early 1970s. It’s been recorded by numerous groups and solo artists. The song is about an adulterous love affair in which the singer says that if loving the person he’s having an affair with is wrong, he doesn’t want to be right. It makes for catchy lyrics, but is nothing more than emotional virtue. Decades ago, adultery was considered to be wrong. Today? Not so much. People grin at it or pretend to be upset over it (unless it’s happened to them), but in general, it is far more acceptable today to have an affair than it was years ago. Times have changed drastically and all of it means a break down in social mores. Since the late 1950s (at least in modern times for this generation), institutions like marriage have been under attack. The best way to do that is by brainwashing people into thinking something else. The best way to do that is by using mediums that are constantly in people’s faces. This is where TV, movies, video games, and music come into play. Eventually, through years of pushing envelopes and agendas, society is moved off its original axis (whatever that happened to be) and is conformed to a new set of beliefs. This is how anything is accomplished in society and it is no different where religion or false Christs are concerned. These false Christs will win people over eventually except for those who are avowed atheists or staunch Christians. Aside from these two groups, there are plenty of people for these false Christs to pick from and they are masters at Neuro-linguistic programming (NLP) and other forms of unofficial brainwashing. We ended our last article with Birth Pain (or “pang”) #1, which was global conflict. This is based on Jesus’ words when He stated that “nation will rise against nation, kingdom against kingdom.” This, as we learned, is a Jewish idiom which has roots in Scripture prior to Jesus’ time and was used to distinguish the area involved in the conflict. In Jesus’ usage, He was referring to the entire world being engulfed in conflict. This of course occurred with WWI (and WWII). This was really the first time the entire globe was caught up in war. I’ve included a couple of charts I created for this series. The one above highlights the connection between the global conflicts of both WWI and WWII and the resultant earthquakes and famines. The second one – just to the right – highlights the 9 birth pangs that are predicted in Scripture that will take us up to the very end of this age. As stated, we dealt with the first pang last time, global conflict. Birth Pang #2 focuses our attention on Israel and the fact that, against all odds, it became a nation again in 1948. This was actually predicted in Scripture hundreds of years before it ever occurred. People today like to argue about whether or not the Jews in Israel are “real” Jews or imposters. That fact has nothing to do with anything at all. God’s Word describes Israel coming back from the dead. The whole of Ezekiel 36 refers to Israel physically. The chapter talks about the Mountains of Israel and while some commentators prefer to take what is in chapter 36 allegorically, not only is there no real reason to do that, but to do so changes the meaning entirely. These people like to say that God is ultimately referring to the Church here (because they believe that God fully rejected Israel as a nation when its leaders rejected Jesus, the Messiah). The problem is that the message to Ezekiel, which he then disseminated, was to and about Israel, not the Church. The text itself makes this very clear and plain. Let’s look at just a few verses from that chapter, but you should really take the time to read the whole thing. 22 “Therefore say to the house of Israel, ‘This is what the sovereign Lord says: It is not for your sake that I am about to act, O house of Israel, but for the sake of my holy reputation which you profaned among the nations where you went. 23 I will magnify my great name that has been profaned among the nations, that you have profaned among them. The nations will know that I am the Lord, declares the sovereign Lord, when I magnify myself among you in their sight, (Ezekiel 36:22-23). This preface statement by God clues Ezekiel into the reason God was going to do what He had decided to do and it concerned Israel and the Jewish people. Notice He says that His problem with Israel and the Jews is that they “profaned” God’s “holy reputation…among the nations where (they) went.” This is referring to the Jewish people here, not Christians. Wherever Jewish people were scattered, instead of being a light to people in darkness, they often ended up living the same way the Gentiles lived. There was virtually no difference in lifestyles. God was not pleased at all. Clearly, God is very concerned with His reputation and Name that have been defiled by Jewish people. But in spite of this, God has a plan for Israel, which we learn about starting in Ezekiel 36:24-32. 24 “‘I will take you from the nations and gather you from all the countries; then I will bring you to your land. 25 I will sprinkle you with pure water and you will be clean from all your impurities. I will purify you from all your idols. 26 I will give you a new heart, and I will put a new spirit within you. I will remove the heart of stone from your body and give you a heart of flesh. 27 I will put my Spirit within you; I will take the initiative and you will obey my statutes and carefully observe my regulations. 28 Then you will live in the land I gave to your fathers; you will be my people, and I will be your God. 29 I will save you from all your uncleanness. I will call for the grain and multiply it; I will not bring a famine on you. 30 I will multiply the fruit of the trees and the produce of the fields, so that you will never again suffer the disgrace of famine among the nations. 31 Then you will remember your evil behavior and your deeds which were not good; you will loathe yourselves on account of your sins and your abominable deeds. 32 Understand that it is not for your sake I am about to act, declares the sovereign Lord. Be ashamed and embarrassed by your behavior, O house of Israel. Again, commentators like to take this section out of context and apply it to Christians and the Church, but clearly, when it is actually left within its context, it can only apply to Israel. Starting with verse 24, we learn what God’s plan is concerning Israel. Jesus echoes this just prior to His Olivet Discourse when He states, “For I tell you, you will not see me again, until you say, ‘Blessed is he who comes in the name of the Lord’,” (Matthew 23:39). This is actually Birth Pang #2 because this began occurring officially in 1948. What about the rest of the text, you would do well to ask? It hasn’t happened yet! This is a process that God is doing with Israel to get them ready for the final remnant to enter into the Millennial Kingdom where Jesus will reign. Isaiah 11-12 discuss this same thing, much of it dealing with the results of God regathering Israel, sprinkling them with water to purify them, giving them a new heart, and bringing them into the Land where they will finally and fully enjoy all the Land that was promised to them via Abraham. But it is clear from Scripture that this is a process that doesn’t happen overnight. In fact, the regathering itself of Jews to the Land has taken decades and even a few generations and it is still ongoing! Ezekiel 36 leads us directly into Ezekiel 37 where God uses the vision of the Valley of Dry Bones to further explain His plans for Israel. Again, though some commentators apply this chapter to the Church (or Christians), it is clear from the verbiage and context that God has Israel in mind. In fact, Ezekiel 37:11a says this about the vision. In spite of this clear declaration by God to Ezekiel, some commentators have decided that “allegorically,” God meant “these bones are ‘the Church'” instead of “the people of Israel.” How DARE anyone deign to change the meaning of Scripture to suit their eisegesis! God is being extremely clear here yet our modern “higher critics,” Preterists, and other “scholars” have decreed that even though the text states one thing, they tell us it actually means something else entirely. We will continue discussing this particular Birth Pang in our next installment because I want to show the process that God lays out in Scripture to bring Israel back from the dead as a nation. We need to realize that prior to 1948, Israel had not been a nation for hundreds of years. Yet, what was once dead came to life. Yes, many Jews today are still living in unbelief, but the truth is that God’s process for bringing Israel (and the final remnant) to life has been underway. Entry filed under: christianity, Cultural Marxism, Emotional virtue, israel, Judaism, Political Correctness, Politically Correct, Religious - Christian - End Times, Religious - Christian - Prophecy, Religious - Christian - Theology, salvation, second coming. 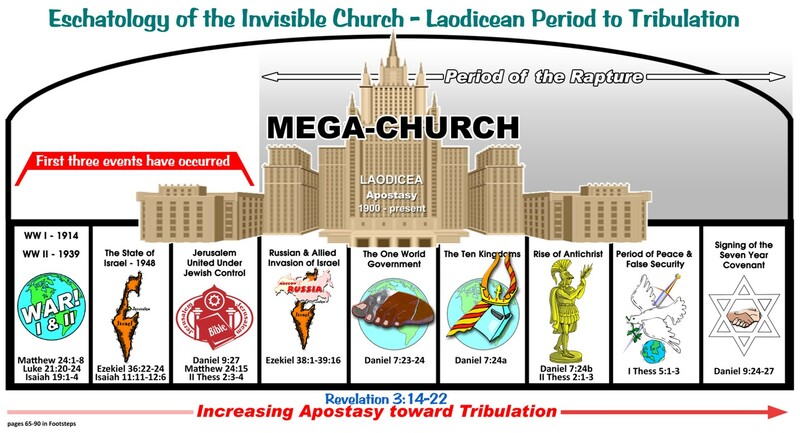 Tags: apollo c quiboloy, earthquakes, ezekiel 36, ezekiel 37, false christs, false messiahs, famines, global conflict, nation against nation, olivet discourse, valley of dry bones is not the church. 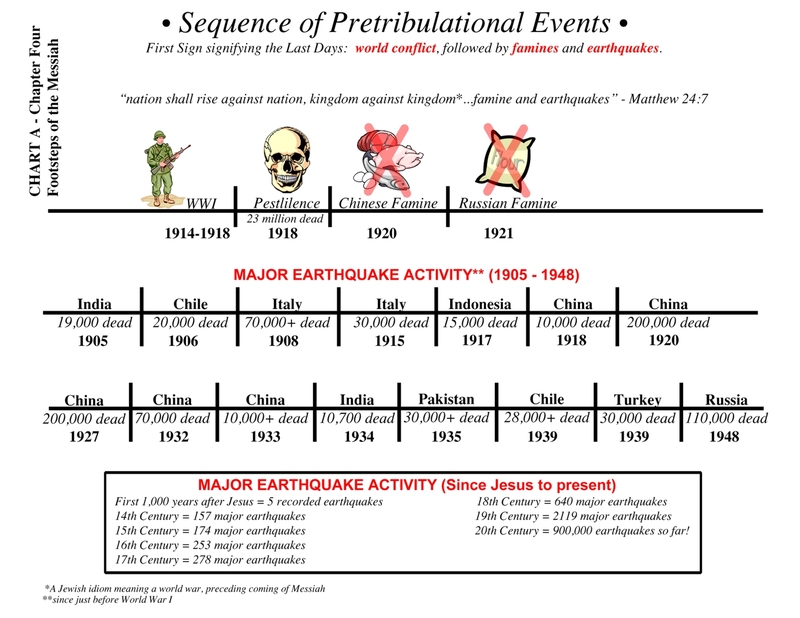 Is it possible to get a closer (blow up chart of the Sequence of Pretribulational Events? This would be a great teaching tool to the deaf. Okay, I’ve fixed the problem. Apparently – and I wasn’t aware of this since they updated WordPress – you have to actually do a few more steps in order to the image to be clickable and appear larger in a separate window. Let me know if it does not work for you.